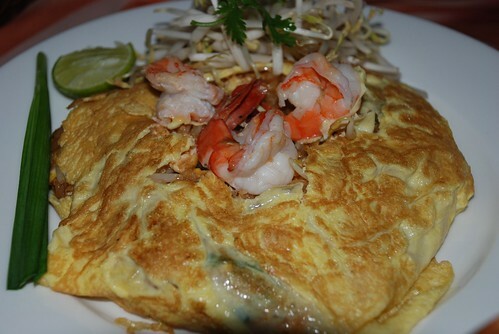 Do you like Thai restaurants? It's a bit hard to decide which Thai restaurant to go to in Ho Chi Minh as there are so many to choose from. 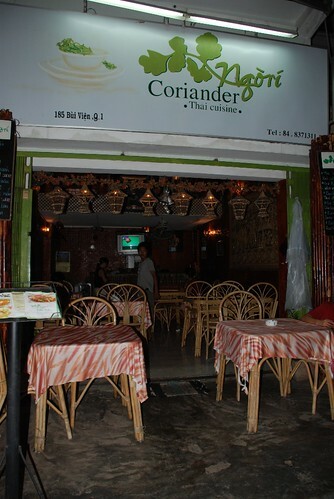 My friends told me about the Coriander Restaurant in the back packer area in Bui Vien street. This is a small and simple restaurant like others in this area. When choosing where to sit, there are three options that you can choose: the second floor, the first floor or the back room. I love the back room because it's very simple, traditional seating on floor cushions and nice Thai paintings on the walls. 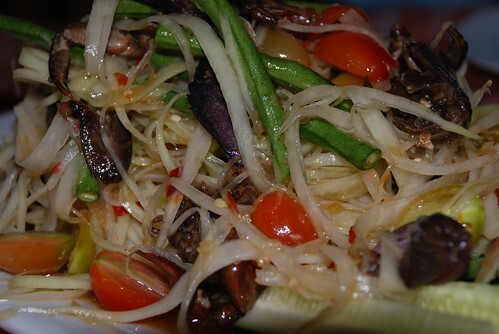 The menu highlight was Pad Thai, great Thai green papaya salad and you cannot miss the Thai green chicken curry. Take care though, as I was nearly crying when I finished the curry because I forgot to tell the waitress to make it mild. 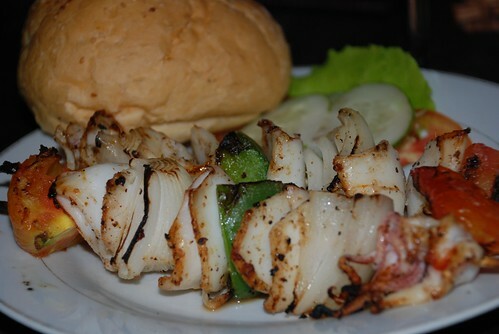 Beside the Thai menu items, they also have some other Vietnamese and Western dishes and imported Thai drinks. The food is presented carefully and really tasty with big serves and quite cheap compared to other Thai restaurants in town that I've been to. I recommend this one! 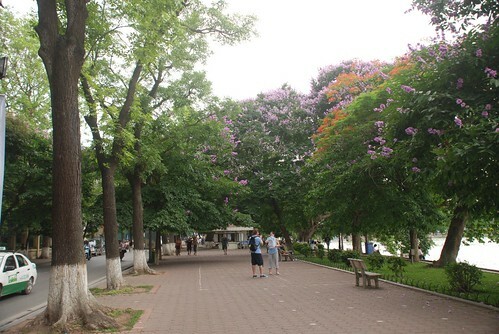 Summer in Hanoi is coming bringing with it a variety of fantastic colour in the form of flowers. The temperature is also on the rise especially in the noon time on the motorbike with a heavy helmet on. Damn hot! 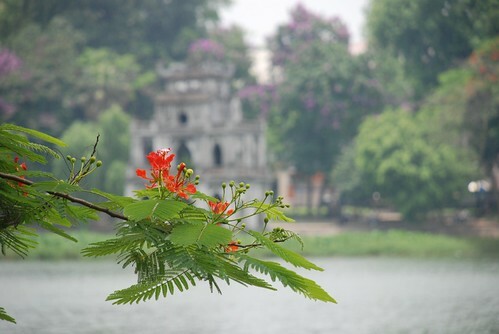 Wandering around Hoan Kiem lake on these days reveals the beauty of the city. The mixture of red, purple, white and green colors in the landscape makes the lake like a beautiful painting. 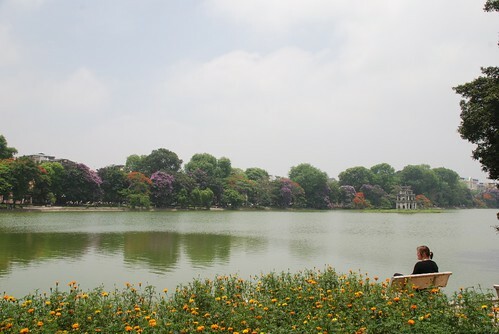 That's why people love Hanoi so much. Hanoians are sitting around Truc Bach lake, too, drinking and eating til late at night during summer. Finding a cool breeze is a priority and the lakeside is a good bet. Sometimes though, the street police men come and most street businesses disappear, leaving customers standing with their plates or glasses. Once the police are gone, everything returns to normal. It's a funny scene! 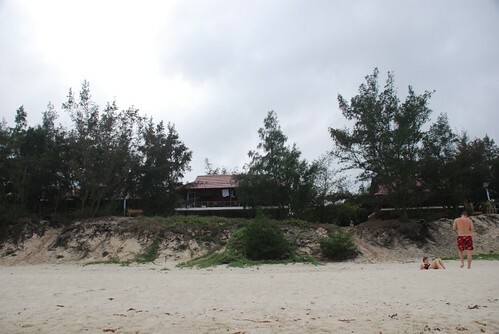 Just by chance rather than good planning, my friends and I got the last available booking at Van Hai Resort which is located on a wild hidden beach on Quan Lan Island. The recent public holidays joined to the weekend created the perfect opportunity for a break from life in the chaotic capital. And the atmosphere on Quan Lan Island is about as relaxing as you’ll get. The simple accommodation offered by the Van Hai Resort was fitting too. With rooms in stilt houses looking through the conifer trees and down the sand dunes onto the sea, we settled down for a five day stay. The cold shower bathrooms and fan rooms may not be everyone’s cup of tea but the sheets and towels were replaced daily and the beer was delivered cold in a polystyrene box full of ice. We sat on our long balcony with our feet on the rails, beers in hand, forgetting the pressures of city life. The complex is owned by Viglacera, a government owned company which makes porcelain basins and toilet bowls. Ironically, this company is also responsible for the sand mining one beach around from their resort! 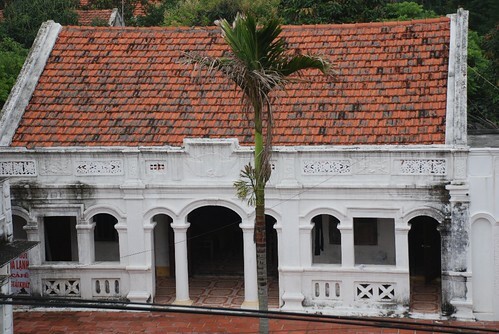 Mr. Ngoc, the deputy manager, says the resort has recently been renovated but has been operating for three years. The surrounding foreshore is largely untouched and uninhabited – no more resorts on the drawing boards as yet, which is a good thing. The only criticism is the difficulty getting fed. 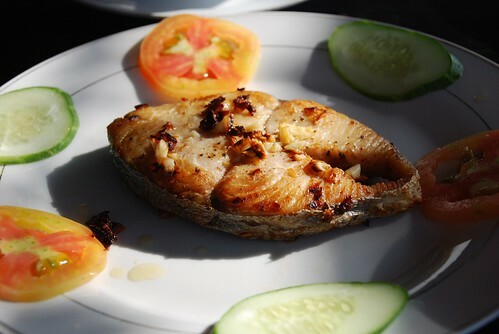 There are several little stalls run by local women within the resort grounds but there’s not much on offer apart from steamed squid, grilled dried squid and instant noodles with egg. There is a restaurant, too – though it has no menus and, anything that can be eaten there needs to be ordered in advance in the morning at highly inflated prices. 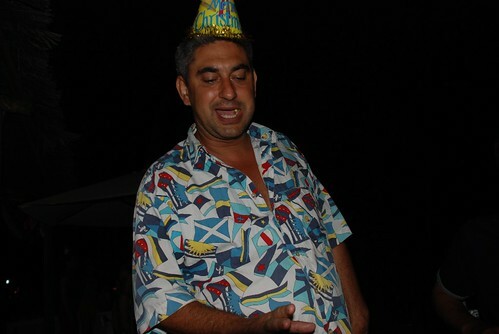 One night, we had a set menu meal there, the dessert for which was one orange on a plate to be split between six people! Go to town for meals is the lesson here! But we were not there for the food. 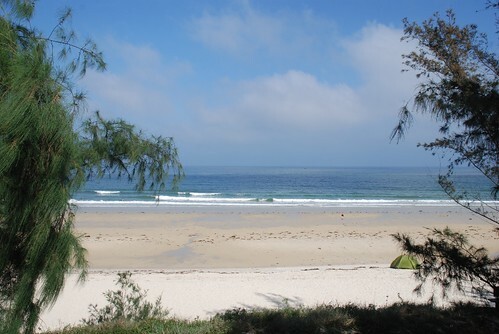 As an escape, to see a bit of my country where development is happening slowly, to be the only one walking along the entire beach – these are the reasons to visit Quan Lan Island. 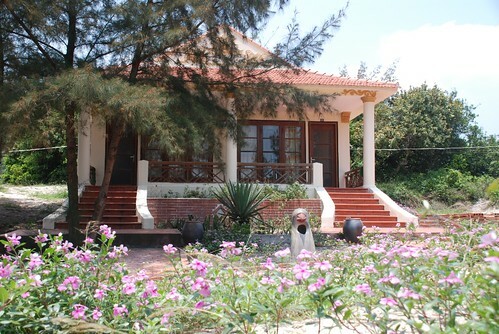 And, with sunrise views over the sea, Van Hai Resort is the accommodation of choice. 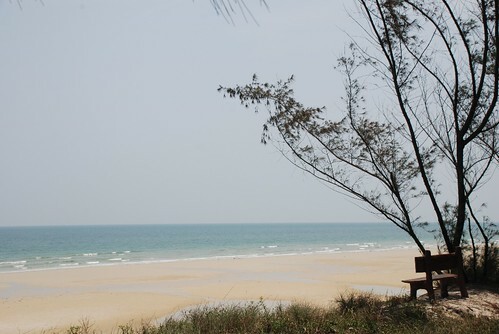 Quan Lan Island is ‘coming out’ as a holiday destination for both local and western tourists. Though still not on the typical tourist itinerary, the island is situated in Bai Tu Long Bay in the Van Don District of Quang Ninh Province, home also to the world famous Halong Bay. With an area of 11 square kms and around 6000 local residents, it is worth visiting for its beautiful white sand beaches and lush green countryside. Mass tourism is yet to make an impression here, which is another bonus. 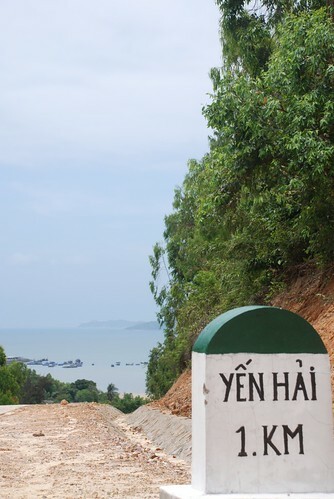 This is probably because Quan Lan is not the easiest place to get to and involves some travel challenges. 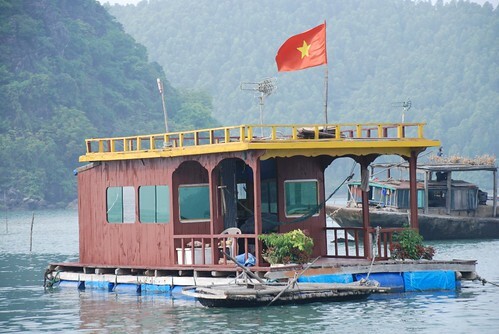 The journey takes a full day of independent travelling, first by public bus from Gia Lam bus station in Hanoi to the ferry terminal in Hon Gai. 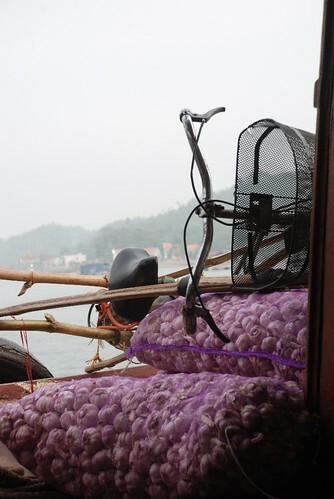 This four hour trip is not for the faint-hearted as the moves of these bus drivers would not be out of place on an F1 race track – in fact, my friends and I abandoned the bus less than halfway to Haiphong after several near misses. I called for a private car from one of the roadside restaurants which did blow the budget a bit but we wanted to arrive alive! From the ferry terminal, it’s a further four hours on an overcrowded boat. So it might sound like a horror trip but it's truly worth that much travel time to reach this great island. The one-road village of Quan Lan has changed quite a bit with many new houses beside the few remaining traditional ones. A wander through the narrow alleys reveals some century old scenes of rural life, though; cottage gardens, courtyards spread with drying food produce, women hand-washing clothes and children playing with stones and sticks. Almost every single house has a dog or two, which are not really aggressive but they do tend to bark during the night and sleep during the day! Outside of the town, renting a motorbike or bicycle is the preferred option although there are dozens of xe lam (tuk tuk) drivers roaming the streets. This form of transport is quite expensive for tourists and, again, requires hard negotiation. We had to pay 100,000Vnd for a seven kilometre round trip, while motorbikes and bikes can be rented for 100,000Vnd and 50,000Vnd per day, respectively, plus petrol. So, with the wind in our hair and a beach in our sights, we toured through the stunning green fields of young peanut plants and rice. A few days spent on one of the islands isolated beaches is a million miles away from the chaos of Hanoi and at least a few kilometres away from the negotiation for our evening meal. 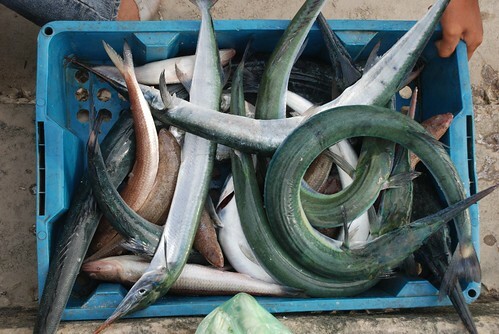 That’s the great attraction of Quan Lan Island. 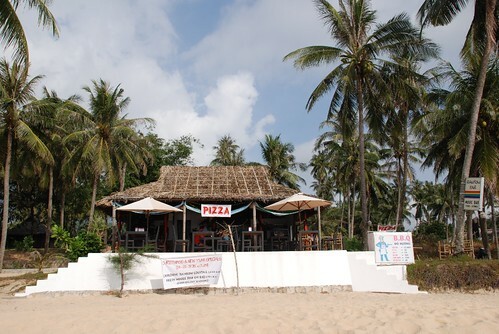 The Rainbow Bar in Phu Quoc is the coolest and most relaxed bar on the island. Located right on the beach, furnished with simple tables and chairs and hospitable staff, it is the place to while away a few hours over drinks, a meal or a book. During my recent trip to Phu Quoc, I visited this bar at various times of the day and enjoyed at least one meal here on each day of my stay. 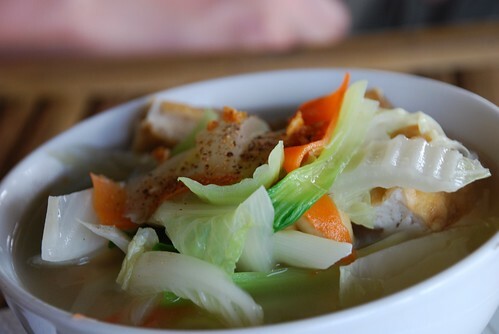 One particular dish which I couldn’t resist was their sour fish broth, a specialty of the south and one that is real comfort food for me. As a son of the south, raised in Nha Trang, I have very fond memories of my mum and sister cooking this soup at home. The Rainbow Bar produces a very fine version of it. The French owner of the bar understands the need for drinks to be cold in this tropical climate. The beer was frosty at all times and he was mindful of wine drinkers, too, making sure that the bottles are cellared and stored adequately and served at the correct temperature. I enjoyed some lovely Chilean Sauvignon Blanc one evening. The Rainbow Bar opened on the island five years ago after a successful period trading in Nha Trang, also beachside. 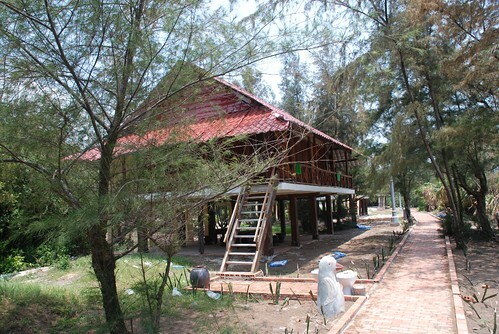 When the local government reclaimed the land to develop the foreshore, the owner was forced to re-locate and saw the potential of Phu Quoc as a growing tourist destination. He hasn’t looked back since. It’s easy to understand why. He has a great location. 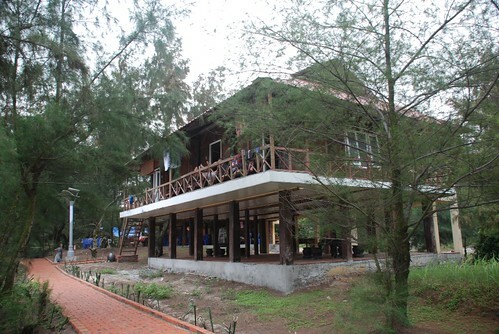 Who wouldn’t want to sit overlooking the sea, watching seafood grill on the evening barbeque, beer in hand and sunset in view. The seafood needs to be ordered in advance to avoid disappointment so I found myself planning my dinner at breakfast time. A fluent speaker of Vietnamese, the owner is a great resource of information on the island. All in all, the Rainbow Bar is my kind of place.